This service allows for selection from a panoply of therapeutic agentsfor gliblastoma, to ensure that only the best ones will reach the most advanced phases. This service offered by NANBIOSIS allows a path for analysis of potential therapeutic agents to be used in glioblastoma. It is a preliminary effectiveness assessment of new therapeutic agents in an immunocompetent preclinical glioblastoma model. It includes in vitro effects over GL261 cultured cells (e.g. EC50 calculation), target validation (e.g. protein kinase CK2 inhibition when using CK2 inhibitors), preliminary studies of 1-month toxicity and maximum tolerated doses, as well as complete in vivostudies for adjusting doses and periodicity for administration. These would allow estimation of classical survival (endpoint validation) and the evaluation of biomarkers of therapy response, either by MRI (RANO, RECIST) or by surrogate biomarkers detected by magnetic resonance spectroscopic imaging. For this, an immunocompetent murine model of glioblastoma will be used( GL261 tumorsgrowing in C57BL/6background). In vitro studies in cultured cells (EC50 calculation) (U25)with target validation, if applicable. Adjustment of dose and administration protocol in the preclinical glioblastoma model (GL261). Comparison of overall survival and progression free survival obtained with commercially available therapeutic agents being used in preclinical or clinical practice. Combined therapy: in vitro studies in cultured cells with evaluation of synergy or antagonism with Chou-Talalay method(1) . In vivo study with MRI/MRSI follow-up and assessment of response biomarkers, either MRI-based (RANO(2) or RECIST(3) traditional criteria or new paradigms related to immunotherapy(4) ) or MRSI-based (surrogate biomarkers of therapy response(5) ). Analysis of the overall survival in comparison with control mice. (1)Delgado-Goñi, T., et al., MRSI-based molecular imaging of therapy response to temozolomide in preclinical glioblastoma using source analysis.NMR Biomed, 2016. 29(6): p. 732-743. 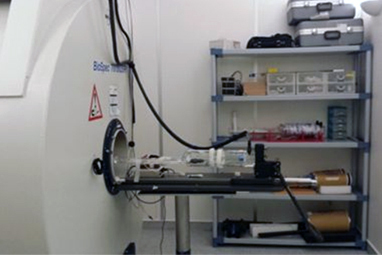 Figure U25 (1): Biospec 7T scanner, in which MR proposed studies will be performed, with the mouse bed assembly. 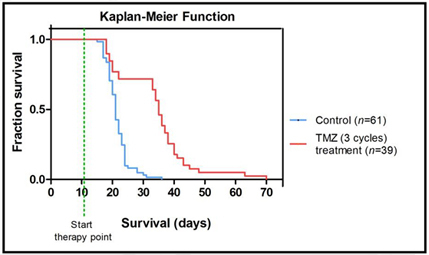 Figura U25 (2): Kaplan-Meier survival curve with temozolomide (TMZ) treated and control mice, showing clear difference, statistically significant, between groups.